I suppose my resolution to start blogging again should include actually writing a post that has something to do with the topic of this blog â€“ home renovation. Which means that I should actually do a project or 2 around the house. Fortunately, we just had a 3-day weekend so in addition to sleeping in, a night out in San Francisco & attending a bbq (thanks for the tri-tip Rachel! 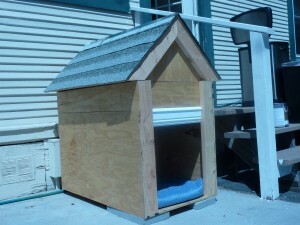 ), we were able to squeeze in a few home projects. Project #1 started when I came home from work during the week and Hugh told me to go outside to see what he did. 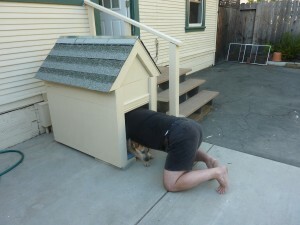 To my surprise, I found a huge new dog house that wasnâ€™t even in the planning stage when I left for work that morning. Then Hughâ€™s Saturday trip to Home Depot included a surprise for me â€“ a spray paint attachment for our air compressor! Awwwwwâ€¦.that means he really does love me :)Â (wow, have I changed over the last year). As part of my prep for the upcoming kitchen cabinet painting project, Iâ€™ve been taking on various furniture painting projects to improve my painting technique before committing to the kitchen cabinets. 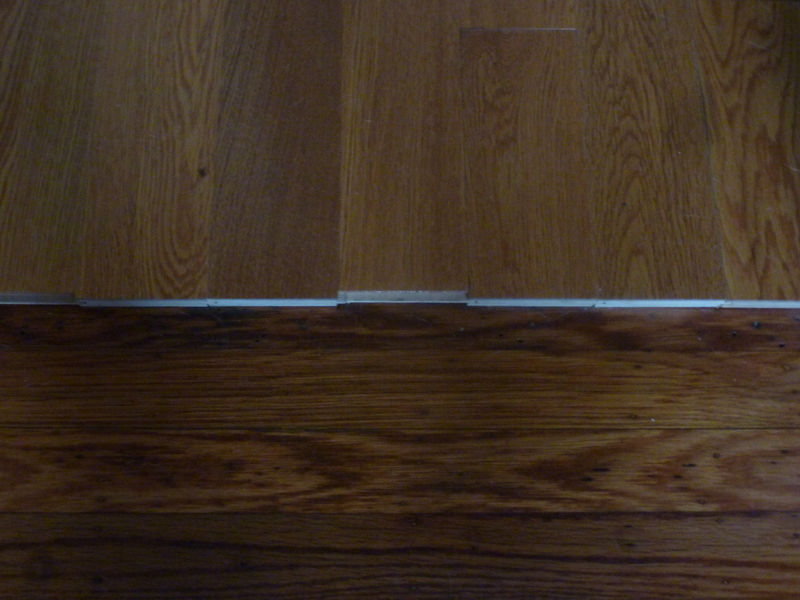 Itâ€™s ok if I have some imperfections in Craigslist finds or cheap furniture we already own, but it would really bother me to see them in the kitchen. Iâ€™ve done a number of projects with rollers & brushes, but I wanted to give spray painting a try to see what the results were and how much time it saved. 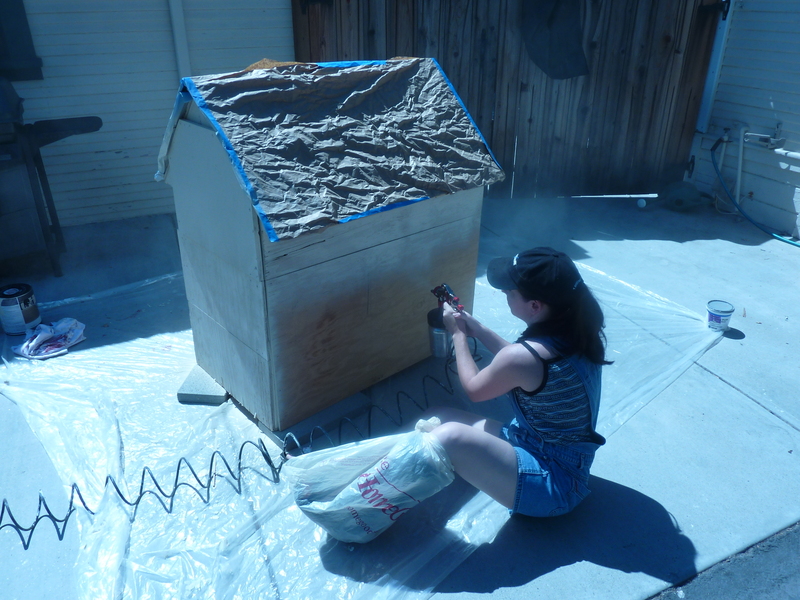 Thatâ€™s a lot of babbling to simply say that part of our weekend was spent spray painting a dog house that probably has a better roof than my own house. 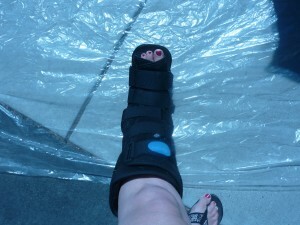 Did I mention the fact that I have a broken ankle in my excuses post? 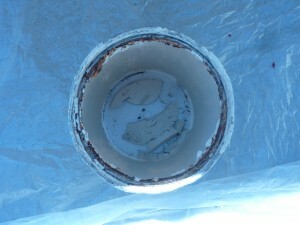 Project #2 was somewhat related to #1. 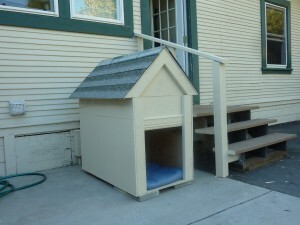 One of the projects that Hugh took on while his kids were in town was building a railing for our back steps. Lack of a railing was noted in our home inspection and my Gramma. 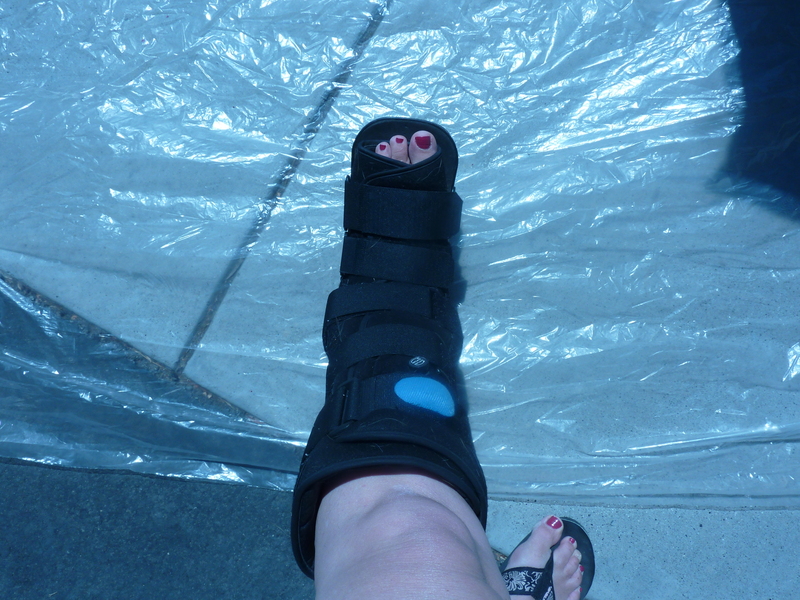 Having a broken ankle also demonstrated the need for one each time I precariously wobbled down the 3 steps. So I came home one day to a new railing that was installed & primed. While I donâ€™t want to complain about free labor, one of the downsides to having an 8 & 10 year-old paint is that theyâ€™re not as careful as I would be about getting white primer on our yellow house. I was able to bring a chunk to Home Depot to have it color matched. 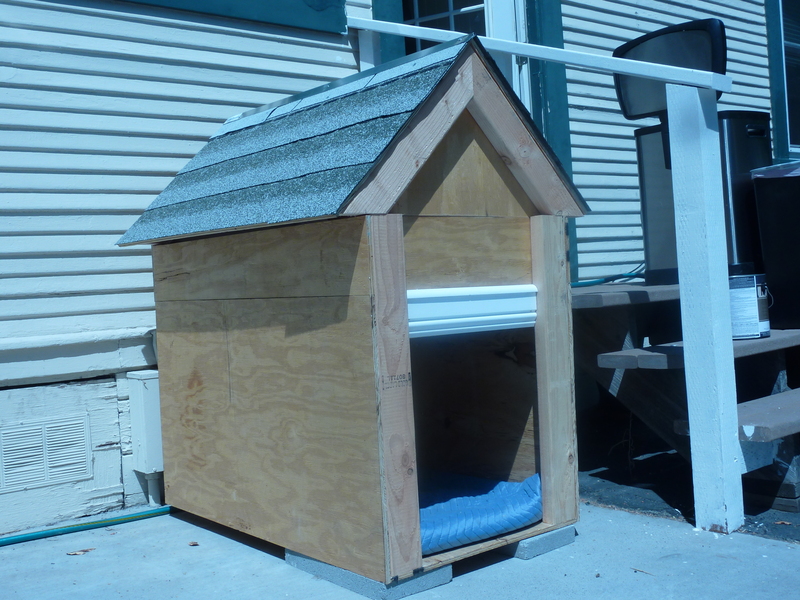 I almost kissed the guy from HD when he asked if I wanted an exterior paint + primer in one â€“ one less step, at least for the unprimed doghouse! I didnâ€™t want to use the spray paint on this one and take a chance on getting paint on other surfaces so did this one by hand, but it was a simple project and only took about 30 minutes. 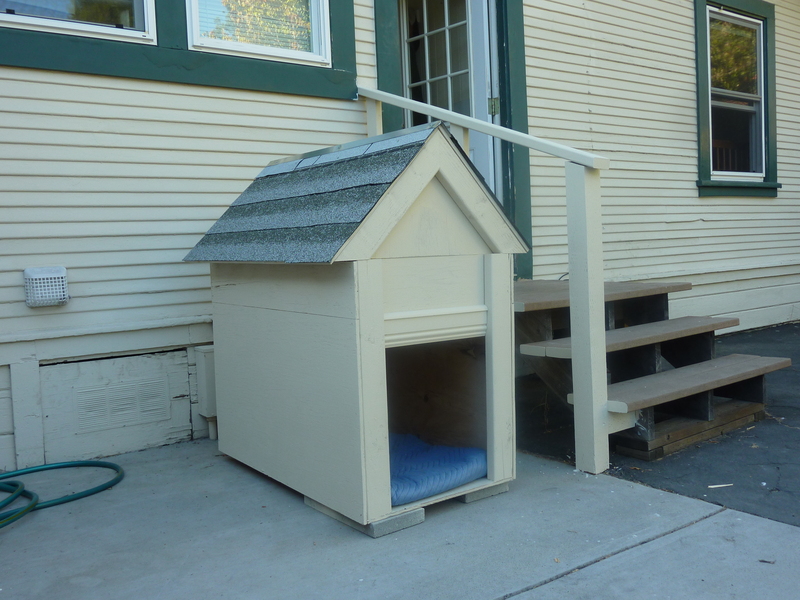 You can see the painted railing next to the pic of the finished dog house above – it’s not exciting enough to warrant it’s own pic. Stay tuned for some touch ups of the house now that I have the paint. Project #3 was all Hugh. 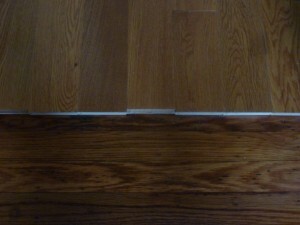 We (meaning Hugh) installed the new wood floors in the hall & bedroom almost a year ago. And for a year, we walked over these ragged, uneven transitions. 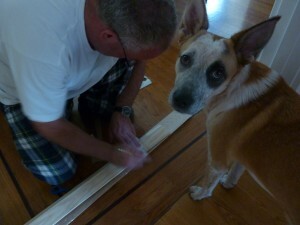 So we got some things done around the house without making the whole weekend a DIY workfest, a good balance. iss genuinely fruitfull in favor of me, keep up posting such content.